Google's Advanced Technology and Projects division unveiled Project Jacquard last week at its annual IO developer's conference. With this unveiling, Google didn't just announce a whimsical technology - it revealed a new way of making material that already has its first launch partner, Levi Strauss, on-board and preparing for launch. 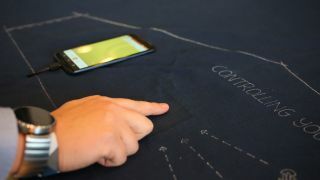 Project Jacquard is the codename for fabrics woven with Google's new touch-enabled conductive yarns that can turn a specific area into a touchpad. While the prototype demos at Google IO were still that, Levi's Vice President and Head of Global Product Innovation Paul Dillinger was on hand to talk more about teaming up with Google, the vision behind Jacquard and what we can expect from our first touch-enabled denim clothes. TechRadar: How did this partnership between Google and Levi's come about? Paul Dillenger: There's obviously an intuitive connection between these companies: Bay Area, iconic brands, global scope. But, [project lead] Ivan [Poupyrev]'s boss and my boss had dinner, and it emerged out of a natural conversation. TR: Does Project Jacquard change the game for the concept of "wearable" technology? PD: What makes this proposition so unique and so compelling is the value in the deployment of the apparel as a platform. And that we're not relying on fashion designers to be the creators of technology gadgets, but to be the integrators of this platform. [We do this by] allowing the development community to bring their creativity to bear, and to really become co-creators. TR: Has Project Jacquard required Levi's to rethink clothing designs to adapt them for this next-generation wearable? PD: I think what the team at ATAP has done exceptionally well is that they have designed [Project Jacquard] so that it can be easily deployed. It's not the easiest thing, it certainly isn't, but it doesn't require new vendors. The mills that are doing this are mills that are already in our source base. The factories that will be making these are factories that are in our source base. What it will require is a new skill set on the part of the designer. First of all, agility. There are certain accommodations that have to be made as the garment is designed, and new challenges emerge [during production]. A conventional process that fixes a sketch, locks it in Illustrator, sends it to a factory, goodbye, and see it in nine months in the store? That doesn't work anymore. The process requires deep engagement with the supply chain as we create. So now there's a requisite malleability, a deference to the peculiarities of this particular material, that hasn't been part of the design process heretofore. The second thing is it will then force the designer to weigh the opportunity to deliver useful value and emotional durability in the clothing against the technical challenges of this deployment and this requisite agility. TR: What does it mean to you as a company to have think about how to integrate electronics into a garment? Sustainability is a passion of mine. Also, regulatory [concerns] around the integration of consumer electronics into apparel are a very serious consideration for a brand that distributes globally and needs to be mindful of each region's regulatory constraints in this space. All of that has been taken into account. We have a strict, non-negotiable restricted substances list, so no component that we might consider potentially harmful will get anywhere near this garment. We are working with the fundamental elements that have always been persistent in a pair of Levi's; they've just in new forms. There's nothing that's going to be problematic here; there's only opportunity.